Cauliflower used to be boring, well not anymore! Its reputation couldn’t be more different today, as more and more health conscious people adopt a gluten free, low carb, plant based diet, a growing number of us are replacing flour, rice and other simple carbs with vegetables. Cauliflower, in particular because of its mild flavour and versatility. Cauliflower pizza base, rice and cous-cous to name a few options. 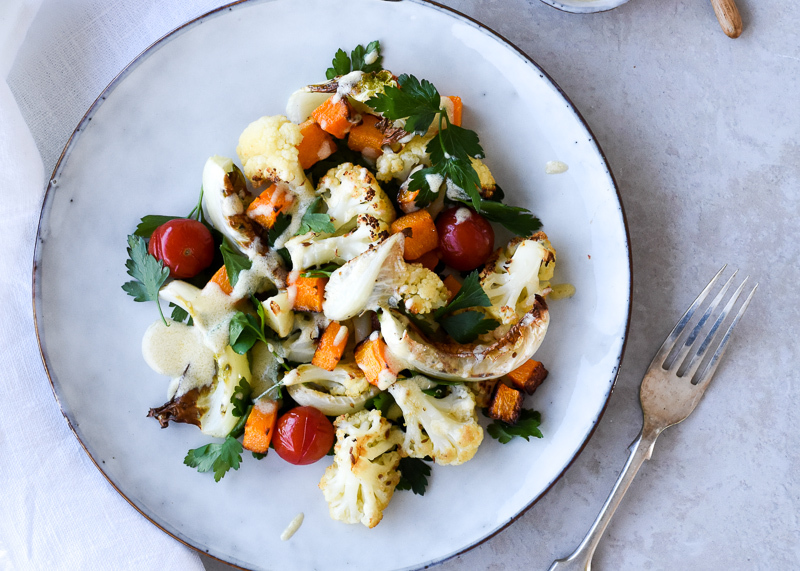 Gone are the days when the only way we ate this white vegetable was dowsed in a cheese sauce, although I love it prepared this way too! Personally I don’t have any dietary requirements therefore don’t exclude any one particular food group. I do like a varied diet though and try and eat organic seasonal fruit and vegetables where possible with some meat and fish. This warm winter salad is lovely as the main event or as a side dish. You can prepare it ahead just don’t dress it, just warm it through in the oven when you need it. 1. Preheat the oven 200C (Fan) Begin by peeling the butternut squash and then cut into 1.5cm dice. Place in a baking tray and drizzle with a little olive oil and season with salt and pepper, bake for 25-30 minutes or until soft. Now tackle the cauliflower, cut the base of the cauliflower and sort through the leaves, discard the very outer fibrous leaves. Cut any large leaves into manageable pieces. 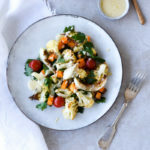 Divide the cauliflower into florets, place the florets only in a separate baking tray, drizzle with olive oil and sprinkle over the cumin seeds and season with salt and pepper. Bake for 10 minutes then add the leaves and tomatoes, toss them around in the tray, bake for a further 10 minutes or until slightly charred and the tomato skins have split. 2. Whilst the vegetables are roasting wash the parsley and remove the stalks. 3. Now make the dressing. Stir the tahini before taking 2 tablespoons from the jar. Place into a bowl and add the boiling water, it will initially thicken but it will loosen up, add the lemon juice and olive oil and season. Add more lemon juice if desired. Tip all the vegetables into a large shallow bowl, scatter over the parsley and drizzle over the dressing and enjoy.